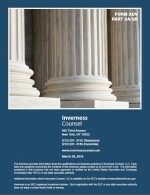 Collaborating with accountants, lawyers, and trusted advisors is a hallmark of Inverness' strategy. As a Trusted Advisor, you are an integral member of the client's team, and an essential resource in achieving their goals. We believe that collaboration inspires diversity of thought and creativity, giving the client a more comprehensive and individualized experience. When you refer a client to Inverness, you will see that we fully embrace this practice. We would welcome an opportunity to join you in crafting a higher level of wealth leadership.